Rising water costs and pressure to conserve water is fueling a new profession. Landscape Water Managers are helping property owners use water more efficiently. Don’t fear the perception that cutting back on water use will impact the appearance of the landscape; the opposite is true. Professional Water Managers know how to save more by using less and improving system efficiency to sustain beautiful healthy landscapes. The work of a Landscape Water Manager has three legs, all three are essential for effective results. A Landscape Water Manager can audit an irrigation system to measure system performance and identify weaknesses in system uniformity. A prescription for improvements may include but not limited to: nozzle changes, fixing sprinklers, pressure control devices, or zone piping changes. Efficiency improvements will often return the investment in less than 1 to 3 years. In addition to the monetary benefits the landscape will look better and you are doing your part to conserve water. The old fashioned fly by the seat of your pants reactive method has been wasting water for decades. 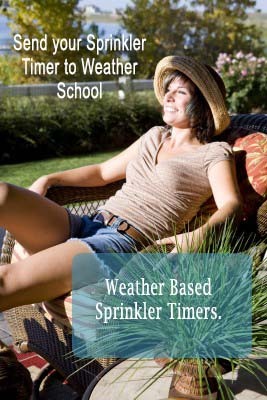 The reactive method starts with off-the-wall settings, then sprinkler controller schedules are changed when the plants dry out or the grass gets too soggy to mow. The reactive process wastes water and needs to be replaced with a proactive approach. A Landscape Water Manager prepares an irrigation schedule using proven science and a complete understanding of conditions at a property. A base irrigation schedule considers landscape conditions and sprinkler system capabilities. Plants have different water requirements. Deep rooted plants do not need to be watered as often. Soil conditions and rooting depth establish the soil's water storage capacity. The purpose of an irrigation system is to refill the soil reservoir. The Water Manager determines the right amount of water to apply and the application rate of the sprinklers to determine zone run time. Multiple cycles may be needed depending on soil and slope conditions. 2) Rainfall should be measured; rain shut-off devices are out-dated because they do not measure rain. 3) Water management style. Horticulturists strongly recommend deep, less frequent watering. Frequency based systems are more advanced and better for plants. A fast talking salesman may try to sway you to accept something less, don't get sucked in. Landscape Water Managers provide a valuable service. The cost of their work will be returned many fold over the years. Remember, over time, most people pay more to water a landscape than they do to install and maintain it. Take advantage of the services of a professional Landscape Water Manager.